Biscuit joiner or domino joiner - which one is right for your next project? ​Making clean, square and strong joins is certainly something to be proud of in the craft of woodworking. Although you can use traditional hand tools to make mortise and tenon joints using dowels or biscuits to make your joints can speed up your work significantly. A biscuit joiner once set up correctly is a much quicker way to join two panels for example. However biscuit do not provide quite as much strength as a ​dowel type joint. Biscuit joins are generally quite limited in the number of applications that they can have. A biscuit does not offer much strength due to the fact that the biscuits are normally quite thin and their shape which is usually a thin flat piece can be quite easy to break across the flattest plane. Where they are most useful is joining two large boards together. For example when joining to large sheet boards that make up each half of a table top. It is the biscuit join that is used more often than not in this scenario as it can really help with alignment which is certainly crucial for something so visible as a table top. A Domino joiner is somewhat of a hybrid between two different types of joins; a biscuit join and a more tradition dowel joint. Although a Domino will cut mortises in a similar way to a biscuit joiner the actual shape of the mortise is specifically designed to only accept the Domino tenon. The tenon is much thicker and stronger than a traditional biscuit. This added strength is one of the major benefits of a Domino joiner over a biscuit joiner. The most obvious disadvantage of a Domino joiner versus the biscuit joiner is the cost. A Festool Domino joiner is extremely expensive and a high quality biscuit joiner can be up to 1/5 the rice of the introductory Festool model. That being said they are made to a very high quality standard. And should last years of usage even in a commercial setting. If you are a professional woodworker who builds a lot of furniture then the Domino joiner is really the one that makes the most sense. DeWalt DWE6421K vs DWE6423K which random orbital sander should you buy ? ​If you are in a hurry then our recommendation is to go for the DWE6423K with it's variable speed control and low profile form factor make it a breeze to use. The DeWalt DWE6421K is powered by a 3 Amp motor. The DWE6421K accepts the standard 5 inch eight hole sanding pads that are readily available. They use a hook and loop fixing system for less slippage especially after prolonged use. There is a dust collection bag included and the dust port can also be hooked up to a shop vacuum once the dust bag is removed and you have the correct connector. ​As sanders go it is a very high quality model at a very favorable price point. The DeWalt DWE6423K is a variable speed random orbital sander. To help reduce unsightly swirls and marring that can sometimes happen at start up time DeWalt have added it's CFS(Controlled ​Finishing System). This generally happens if you have not let the sander reach peak speed before you apply pressure to it on the surface that is to be sanded. ​Just like the DWE6421K above the DWE6423K has a very easy to hold ergonomic design that helps the operator find the most natural position which can help to reduce fatigue over long usage periods. To confuse things more there is also the D26453K available and is a pretty similar sander to the DWE6423K you can read about them both here. What is the difference between the DeWalt DWE6421K and DWE6423K​ ? To the uninformed the two sanders are near identical but what exactly is the difference ? 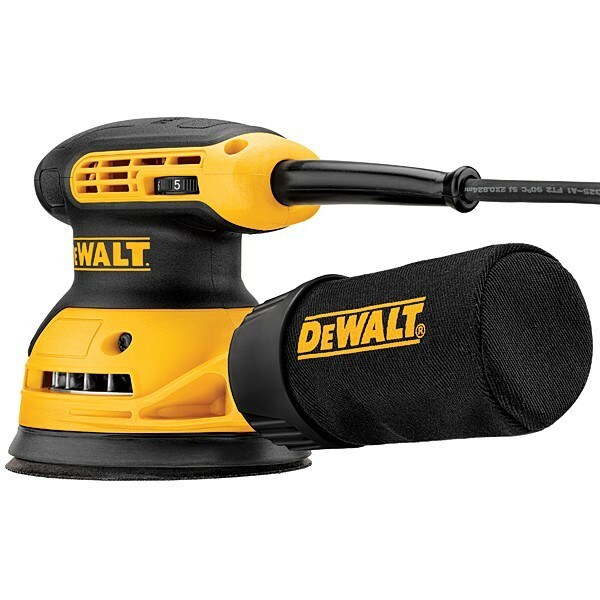 ​The only real difference is the fact that the DWE6423K is a variable speed orbital sander. The DWE6421K is a fixed speed model. Which means you can only run it at 12,000 OPM. The DWE6423K however has variable speed control from 8,000 to 12,000 OPM. Certain types of woods and finishes respond better to a slower speed than a higher one. You can also vary the finish dramatically by the type of sand paper that you are using. ​DeWalt DWE6421K vs DWE6423K which should you buy ? ​Both are effectively the same machine. They share the same motor and at max speed 12,000 should give an identical finish. The variable speed machine the DWE6423K is the one to go for. 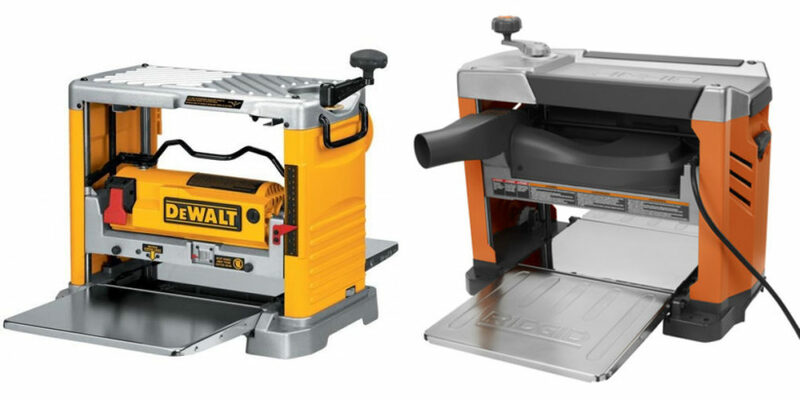 DeWalt DW734 vs Ridgid R4331 which is the right portable planer to choose? Brand wise there are a few offerings from both manufacturers from DeWalt the DW734, DW735 and DW735X. From Rigid there is the R4330 and R4331. The DW734 from DeWalt is powered by a 15 Amp motor giving a max speed of 20,000 RPM. At the cutting head that translates to 10,000 RPM maximum. The infeed and outfeed tables ​at on an extra 33.5 inches of board support helping to reduce snipe on longer lumber lengths. 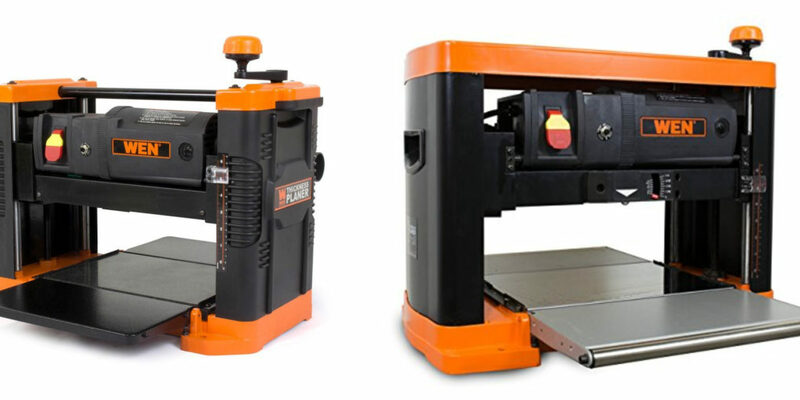 ​The R4331 planer from Rigid is also referred to as the Rigid 13 inch planer just to avoid any confusion you may have. The R3441 is powered by a 15 Amp motor ​and has a maximum speed of 9,000 RPM. Has uses a three blade cutter head that gives a maximum 96 cuts per inch ​giving 27,000 cuts per minute at a feed rate of 23.5 feet per minute. It has a maximum depth of cut of 1/8 of an inch. The Rigid comes with an infeed and an outfeed table to help reduce snipe on your longer pieces. It uses a chip impeller system to help remove waste material away from the cutting head which should result in a cleaner cut. ​DeWalt DW734 vs Ridgid R4331 which is the right one to buy ? 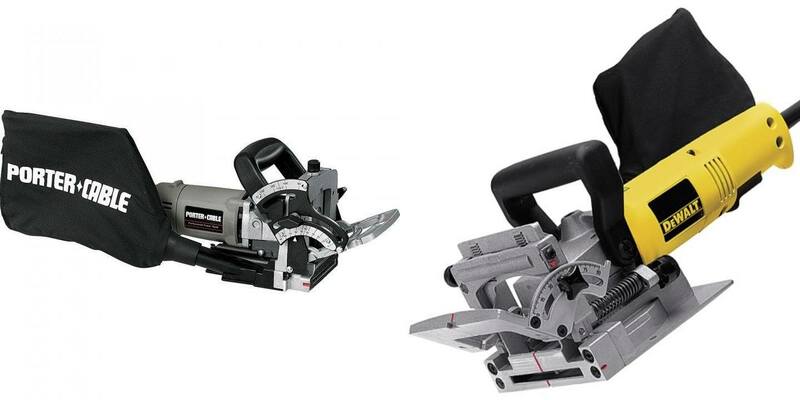 When looking at DeWalt vs Ridgid​ planers they both are of a similar spec. Price wise the DeWalts range from 400 up to 600 dollars depending on where you purchase them from and the Rigid planers tend to hover around the $500 to $600 mark. ​For us the winner is the DeWalt. With a slightly higher blade speed and the greater chance of getting it at a discount online it just about beats out the Rigid. Wen 6550 vs 6552 | Which Planer ? Wondering which planer to choose the Wen 6550 vs 6552 ? The Wen 6550 is a 12.5 inch thickness planer that is powered by a 15 Amp motor giving a cutting speed of 18,000 cuts at a feed rate of 26 feet per minute. It has a dual blade design and can plane boards up to 6 inches thick. The blades can be reversed to help extend their operational life. A smooth granite table is virtually warp free and the base is made from heavy cast iron for added sturdiness. There are height adjustable infeed and outfeed tables that can help to eliminate snipe during usage.​ There is also a tri-roller system to keep the feed as smooth as possible. ​For each pass at the blades a depth knob adjuster enables you to strip off up to 3/32 of an inch per round. The Wen 6552 is a 13 inch table top planer that has a cutting speed of 25,500 cuts per minute at a feed rate of 26 feet per minute. ​Wen 6550 vs 6552 which do you choose? Well clearly they practically the same machine the decision you have to make is do you need the slightly wider board size of 13 inches ? If you are on a budget the Wen regardless of the width certainly makes sense however if you are looking for something from one of the bigger brands then the DeWalt DW734 or DW735 ​may be more suitable. Looking at the both orbital sanders it's plain to see that they share a lot of very basic design elements. DeWalt D26453K vs DWE6423K so which oe should you buy? 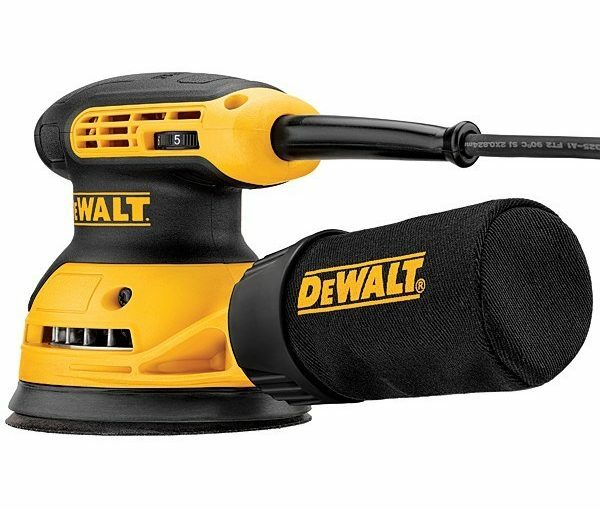 ​The D26453K random orbital sander from DeWalt is probably the top orbital sander available on the market right now. It is powered by a variable speed 3 Amp motor. With an operating range of between 7,000 and 12,000 OPM(Oscillations per minute) it offers a pretty versatile operating speed range so that you can match the sanding speed to the specific hardness of wood you are sanding. ​DeWalt have integrated their CFS(Controlled Finishing System) into the D26453K. CFS helps to reduce the gouging and marring of the wood surface as you start up the sander. Holding a sander on the surface to be finished is not a good idea so you are much better off allowing it to hit peak speed before you press it onto the surface. ​It has a nice ergonomic design and is easy to hold and maneuver for long periods of time. The main handle on the top is coated in a non-slip rubber like material that is easy to grip for just about anyone. ​The DeWalt DWE6423K is the newer version of the D26453K. It has virtually the same motor and sanding performance. It has a 3 Amp variable speed motor that runs between 8,000 and 12,000 OM. There is also a singe speed model available called the DWE6421K. ​So what the difference between DeWalt D26453K vs DWE6423K ? Well the DWE6423K is the newer model in the range. It has a slightly lower profile than the D26453K and DeWalt claim that it will transfer slightly less vibrations through to the operators hands. So the DWE6423K will probably be a little more comfortable to hold over longer periods of time. The only real distinguishable thing between either is the variable speed range. On the D26453K the range is 7,000 to 12,000 and on the DWE6423K it is 8,000 to 12,000. That difference shouldn't really matter to most people. ​Personally I would buy which ever is on sale or the one you can get the cheapest. Why? Because performance wise they are effectively the same sander. Same motor, control, same accessories and the same finish. So choose the cheaper of the two depending on where you are shopping. The two best mid-range biscuit﻿﻿ joiners available head to head its the Porter Cable 557 vs DeWalt DW682K biscuit joiner face-off. If you are looking for a new biscuit joiner and are not looking to spend a fortune on a Lamello or even try Festool's Domino joiner(that is also a small fortune) then the Porter Cable vs DeWalt biscuit joiners are the top two choices on the market right now. The Porter Cable 557 has very powerful 7 Amp motor. With it's high end motor can tackle pretty much any hardwood you can throw at it. The rpm tops out at an impressive 10,000 rpm. The biggest advantages the Porter Cable has over it's competitors are it's versatility and quality. The 557 has an industry leading fence adjustment. It's fence can be adjusted to a max setting of 135 degrees with the usual adjustable stops at 90 degrees. The majority of other biscuit joiners are only adjustable to 90 degrees maximum. The ​fence also features a micro-height adjustment knob that enables correct positioning leading to greater precision and more versatility. The fence also boasts a lock on trigger and has a specially designed pivot point that gives more accurate height reading than other plate joiners. ​The DeWalt DW682 is powered by a 6.5 Amp motor with a top speed of 10,000 rpm also. It's design is a one piece fence that can be adjusted from 0 through 90 degrees. The accuracy of the cut is mostly about ensuring that the fence and the blade are parallel this is assured via a twin rack-and-pinion system for adjusting the fence. Keeping the fence and your wood surface firmly connected during cutting are anti-slip pins ​which can help greatly with keeping your alignment true and accurate. Just like the DeWalt it comes with a dust collecting bag ​that can be hooked up to a shop vacuum. Included in the box is a carbide blade, vacuum adapter, dust bag, wrench and Torx key plus a kit box to store and transport it in. What is the difference between DeWalt DW682 vs DW682K ​? The DW682 is the tool only model number. The DW682K is the full biscuit joiner kit which is the one reviewed here. Note you can no longer purchase the DW682 as a stand alone tool. It must now be purchased as the DW682K kit. 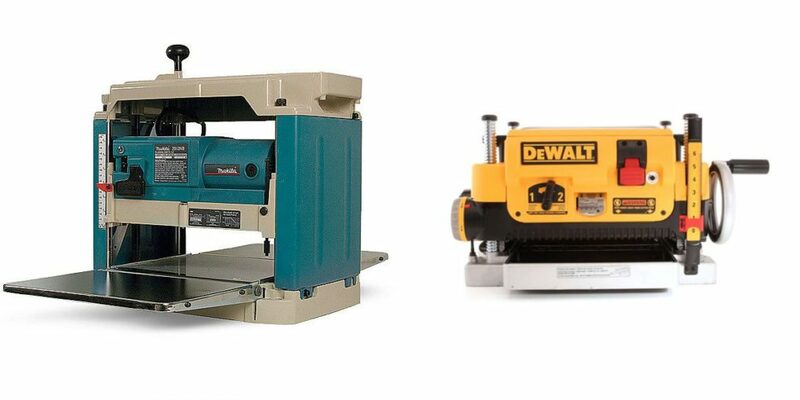 ​Although both models perform very admirably and are also incredibly popular choices for the average woodworker there can only be one winner. The Porter Cable 557 is a clear winner over the DeWalt biscuit joiner. It has a slightly more powerful motor 7.0 Amp versus the DeWalt's 6.5 Amp. The fence is adjustable from 0 to 135 degrees against the DeWalt's standard 90. It can also accept a smaller 2 inch blade that allows for even smaller biscuits to be used which is quite useful on smaller form factor pieces. However the DeWalt is still a solid performer and if you are on a strict budget or only need to make the occasional biscuit join it might be the better option ​. Two planners that have gained a great reputation with woodworkers. We compare the Makita 2012NB vs Dewalt DW735 to see which is best. The Makita 2012NB is a 12 inch planer. Powered by a 15 Amp motor it has a no load rating of 8500 rpm. It is capable of handling the majority of woods and with that kind of power should be sufficient for just about anyone. It has built a reputation as one tirelessly durable machine. Most people that own one tend to do so for many many years and it should last a long time provided you do some routine maintenance once or twice a year. Cleaning out the rollers and internal body of dust and checking the ​blade for any deformities are all that is really needed on most modern planners. Saying that the major complaint with the Makita is the risk of snipe. Even with the Interna-Lok system it has been known ​to produce somewhat deeper cuts on the board edges, but with careful alignment of the board height on entry/exit you may avoid this. 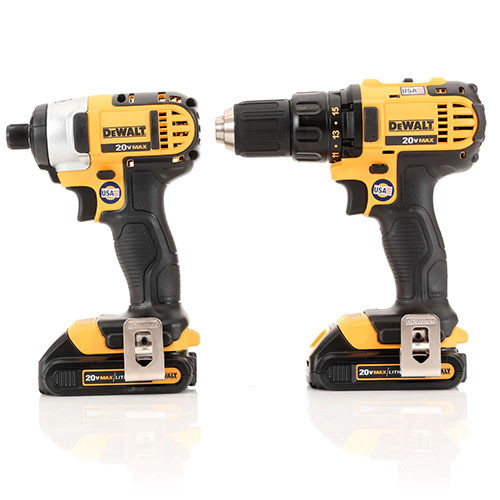 ​The DeWalt DW735 is available in two models the DW735 and DW735x. The "x" stands for extra. They are virtually the same machine. However the DW735x comes with an additional set of blades and infeed and outfeed tables. The DW735 ​thickness planer is powered by a 120 Volt 15 Amp motor. It has a max no load speed of 20,000 rpm and at the head 10,000 rpm. It is capable of cutting boards of up to 12.5 inches wide and a max depth of 6 inches. Thanks to a two speed gearbox you can vary the cutting speed depending on your chosen material. For a cleaner work space i​t has a "Chip Ejection System" instead of just having a dust hood for collection the chips and dust is blown into the hood/shroud and deposits them on the floor beside the planer. ​It also features an auto lock feature on the carriage which can speed up performance if you need to get through a lot of wood quickly as there is less manual intervention in the setting up process for each pass. ​Ultimately there can only be one winner among the two planners. On the one hand you have the reliable Makita that although is extremely well built it does still suffer from the posibility of snipe on the edges of the lumber. And the DeWalt ​has the superior cutting performance and precision, however you must pay extra for the infeed and outfeed tables if you purchase the DW735, if you buy the DW735x however they are included along with extra blades. For us the winner is the DeWalt it just gives a better end product than the Makita, it also has a slightly wider table at 12.5 inches versus the Makita's 12. A high possibility of snipe is just not good enough to risk with the 2012NB plus you get a 3 year limited warranty over the Makita's one year. Two plunge kit routers head to head it's the Bosch 1617EVSPK vs DeWalt DW618PK. Having the option to use your router in either configuration is generally the best value for money. Fixed base routers are great for trimming edges and they are used extensively when making high quality joints. A fixed based router is generally preferred when using a dovetail jig. The fixed base router is considered more accurate than a plunge router.​ As it easy much easier to mount on a router table and generally can be adjusted in much smaller increments. A plunge router really comes into it's own when you need to cut into the middle or away from the edge of a piece of board. The plunge enables you to place the router over the board and then lower the bit accurately and perpendicularly to the board. It is perfectly suited to making cuts using a template or making mortices and flutes. More accurate plunger, higher quality motor locking mechanism than on the DeWalt. Let's take a more in-depth look at each router kit. Both have there strengths and weaknesses and price wise are roughly the same. ​The Bosch 1617EVSPK is a 2.5HP 12 Amp variable speed plunge and fixed-base router kit. The 12 Amp motor is more than capable of cutting through hardwood boards and edges. It features a soft start; which means it raises the rpm slowly until it hits peak rpm. A slow start helps to ensure that you don't damage the surface material surrounding your cut. 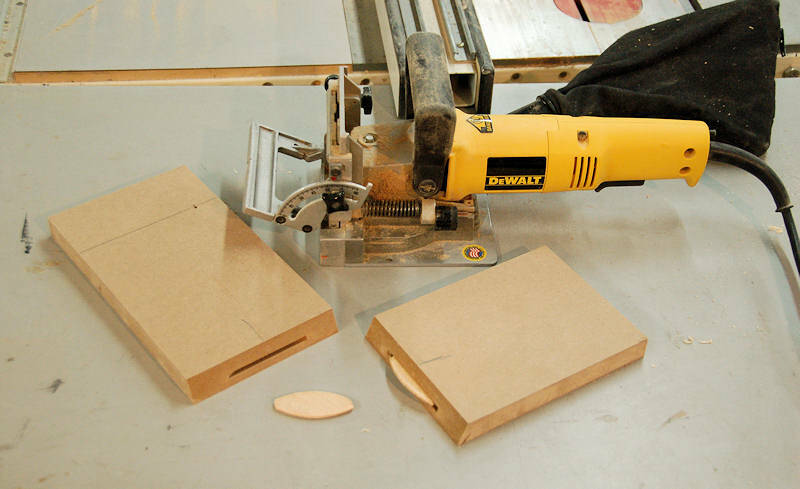 Plunging a router too quickly onto wood a max speed can result in small nicks and tears around the cut. The constant response circuitry gives a smooth and consistent power and torque delivery at your desired rpm. It is compatible with both a Bosch router lift and numerous router tables such as the Bosch RA1171 or RA1181. For added reliability there is a definite click when it is ​secured in either. On the third click the router is properly affixed to the table/lift. ​It's variable speed of between 8,000-25,000 rpm allows you to match the bit speed to the materials you are cutting. Matching the speed means better cleaner cuts and certain router bits perform at their best only a specific rpm when used on certain types of wood. ​The DeWalt DW618PK is a 2.25 HP 12 amp variable speed plunge and fixed base wood router kit. With variable speed from 8,000 to 24,000 it has a versatile cutting range suitable for a variety of different wood strengths. It comes with 1/4 inch and 1/2 inch collets included. It has a through-the-column dust collection system​ which should accept a standard shop vacuum keeping your work space clear ad clean from dust. For fixed base use there is a micro-fine depth-adjustment ring enabling precision adjustment of the router bit in 1/64 of an inch increments. ​Who is the winner in the Bosch 1617EVSPK vs DeWalt618PK head to head ? The clear winner is the Bosch 1617EVSPK. It has a more accurate plunger, better motor locking mechanism and is a better built power tool than the DeWalt. ​Reliability wise there have been numerous reports online of the Dewalt's variable speed control failing. And the occasional motor burning out after a few months. Although it has a three year warranty versus the Bosch's one year, it is apparent that is the less reliable of the two. ​Cost wise they are priced at roughly the same depending on where you purchase the units from. Value wise however we feel that for the money the Bosch unit is the better option. 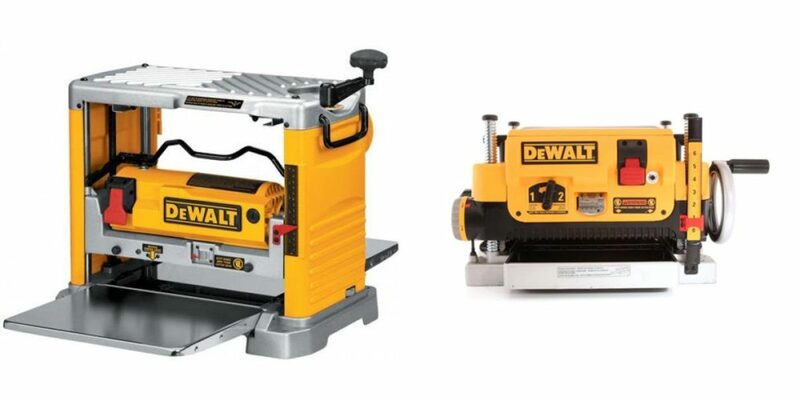 Confused by the choice between the DeWalt DW734 vs DW735 vs DW735X thickness planers? Which one is right for you? No doubt about it benchtop planers have bridged the gap between handheld and cabinet style thickness planer. They offer a near perfect finish for short to medium sized boards with the added convenience of portability. Dewalt are a tried and trusted brand in the pro power ﻿tools arena. They have three different thickness planers available in it's DW73X series. ​They vary slightly terms of size, cutting ability and features. Lets take a look at each one individually before comparing. The DeWalt DW734 thickness planer is the older brother of the DW735. It is powered by a 120 Volt 15 Amp motor. The motor has a max speed of 20,000 rpm(10,000 at the cutting head). It can accept boards of up to 12.5 inches in width and 6 inches in depth. The cutting depth is variable from 0 to 1/8 of an inch and can do 96 cuts per inch. Like all DeWalt planers it features a three knife cutter head. The knifes are reversible and DeWalt claims that they deliver a 30 percent knife life. The DeWalt DW734 also comes with an infeed and outfeed table. The two combined ​add an extra 33.5 inches in length to further support the board on the way in and out and drastically reduce the chance of sniping of the boards described below in the DeWalt735x review. ​The DW743 weighs in at 80 pounds so it does have a bit of weight in it to get it firmly rooted on your benchtop or table. Now that we have seen the DeWalt DW734 review it's time to discuss the newer and slightly larger DW735. The DeWalt DW735 has the same power as the DW734 above. It can accept slightly wider boards at 13 inches and has the same cutting depth of 1/8 inch per pass. However, if has a 2 speed gear box that allows the user to vary the cuts per inch depending on the hardness of the material. The speed can be set to either 96 or 179 cuts per inch. Whereas the DW734 only has an attachable dust hood to help with dust collection the DW735 has a "Fan-Assisted Chip Ejection System". Basically it blows the chips away from the cutting head and into a shroud the targets the wood chips onto the floor beside the planer. A shop vacuum can also be attached to the shroud. The DW735 also weighs in at a rather beefy 92 pounds which is twelve pounds over the ​smaller DeWalt. ​The DW735x has the exact same specifications and performance as seen in the DeWalt DW735 review above. The 'x' in the DeWalt DW735x stands for extras. The extras that are included are an additional set of blades and an infeed and outfeed table. The infeed and outfeed tables help to greatly reduce the chance of "snipe" when you are using longer boards(this rarely applies to shorter length boards that flex less along their length). Snipe is when you get a deeper cut on either the leading or trailing end of the board as it is past through the thickness planer. The main cause is a height mismatch on either end between the board and the in/out feed rollers or the cutting head. Using infeed/outfeed tables that are supplied from the manufacturer should help to reduce the chances of snipe.​ Otherwise you will need to ensure that you have setup how the boards will be fed in to the planer and how they will exit. The decision for most people will probably come down to cost at the end of the day. The DW735 is almost 50% more expensive than the DW734 if bought with the extra tables and blades. Performance wise the DW735 is capable of cutting 13 inch wide boards versus the DW734's 12.5. It also has a two speed gearbox meaning you can vary the cuts per inch to suit the type of material you are working with. The DW735 also has an auto carriage lock versus the manual on the DW734. At 12 pounds in the difference the DW735 is pretty heavy. If you are concerned about just how easy it will be to transport then the DW734 might be a better bet. For the pro or regular user the DW735 or DW735x wins​. If you are an occasional user or are on a strict budget then the DW743 is still a fine thickness planer and it has the tables included in the price. Well the decision between the DW735 vs DW735x all boils down to whether you need the infeed and outfeed tables. If you are only planning on putting short pieces through the planer then the extra tables may not be worth the added expense. However, if you are using longer board sections the only way to help prevent snipe is to purchase the additional tables, or be very careful about how you setup your input and output of the pieces.